There's more to urban art than just graffiti and street art -- it's a symbol of pride for a city, and Chicago's thriving with the best of it. Explore the creative side of The Windy City as Native 312 guides you through the splash of colors and art in Logan Square, a hip nook in the heart of the city. 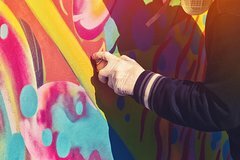 As you trek through the streets, you'll get a breakdown on the history, evolution and future of urban art. We will also visit a gallery that is working with local artists to get there work on display and out to the public.